Neuroanatomy of Mania, Manic Depression, Unipolar and Bipolar Disturbances of Consciousness and Behavior (Updated From: Neuropsychiatry, Neuropsychology, Clinical Neuroscience (Academic Press, 2000) by Rhawn Joseph, Ph.D. There are varying degrees of mania, which may include hyperactivity, coupled with delusions of grandeur, flight of ideas, pressured speech, and grossly inappropriate and uninhibited behavior and sexuality. 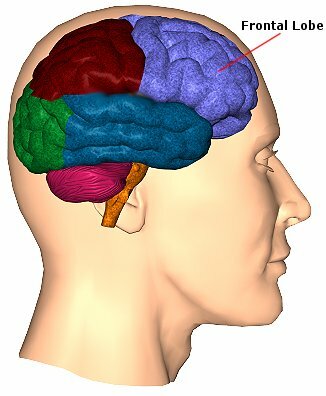 Initially, following right frontal lobe injuries (particularly in males) Mania is not uncommon. By contrast, mania in females, has been associated with abnormalities in the amygdala, temporal lobe, right frontal lobe, and the head of he caudate nucleus. Patients with mania may rapidly altnernate between moods, being happy and giving one moment, and then enraged and accusatory the next. They may believe themselves to be the richest man or woman in the world, and the next accuse themselves of the most horrible crimes against humanity. Hence, in addition to the development of delusions, patients with mania may also display waxing and waning moods, and thus alternate between depression and mania. Depression is often a realistic reaction to injury or death, or other misfortunes. In order to become realistically depressed also requires the cognitive capacity to appreciate and thus feel depressed about the sad nature of the circumstances that they are confronted with. 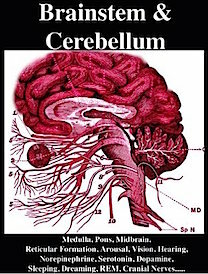 In consequence, that area of the brain mediating the depression may become excessively active, whereas yet another region of the cerebrum which is expressing the depression may become underactive. In general, left frontal injuries are associated with tearfulness, irritability, and depression. Psychiatric patients classified as depressed, and normal individuals made to feel severely depressed, demonstrate insufficient left frontal activation and arousal (d'Elia and Perris 1973, Perris 1974; Tucker et al. 1981). Patients who are severely depressed demonstrate insufficient activation and a significant lower integrated amplitude of the EEG evoked response over the left vs right frontal lobe (d'Elia and Perris 1973, Perris 1974). With recovery the amplitude of the evoked response increases to normal left hemisphere levels--as is also the case as demonstrated in functional imaging studies (Bench et al., 2016). 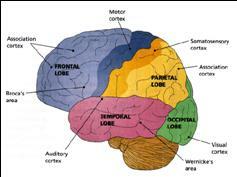 Personality, emotional, mood, and sexual disturbances are a frequent complication of temporal lobe abnormalities. Such individuals may develop paranoid, hysterical, or depressive tendencies, deepening of mood, hyposexuality and other characteristics suggestive of affective disorders (Bear et al. 2015; Gibbs, 1951; Gloor 1986, 1992, 2007; Herman & Chambria, 2010; Strauss et al. 2015; Williams, 2016). Unfortunately, a potential side effect of temporal lobe disturbances is the development of kindling, and perhaps seizure activity. Be it kindling, sub-clinical seizure activity, or the development of temporal lobe epilepsy, as abnormal activity levels wax and wane, personality, emotion and mood may be effected accordingly (e.g. Herman & Chambria, 2010; Strauss et al., 2015; Trimble 1991; Williams, 2016). 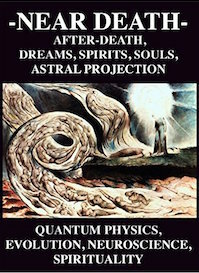 For example, a depressive aura may precede and thus hearld the coming of a seizure by hours or even days. Depression (lasting from hours to weeks) may also occur as an immediate sequela to the seizure (Trimble 1991; Williams, 2016). Perceptions and impressions, as well as thought and language formation may become infected with depressive and manic impulses and abnormally invested with emotional, paranoid, and even religious significance. Patients may appear labile, delusional, or paranoid or wracked by religious guilt and feelings of persecution. Again, such patients may claim to be the most terrible person on Earth and express a depressive-related fear that they are in some way responsible for certain specified or unspecified ills that they perceive as afflicting the world. Moreover, they may not only feel depressed and responsible, but fearful of retribution for the wrongs they have committed. Yet, in this regard, their delusions are exceedingly grandiose and thus represent the manic aspects of the illness. Although in general left temporal lobe abnormalities are more likely to result in psychotic-affective disorders, depression and disorganized mood states are just as likely with right temporal lobe dysfunction (e.g. 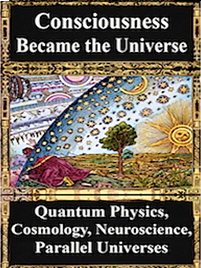 Flor-Henry, 1969, 1983; Offen, Davidoff, Troost, & Richey, 2013; Joseph, 1988a; Sherwin, 1981; Schiff et al., 2015; Taylor, 2012; Weil, 2016; see also chapters 3 & 4). 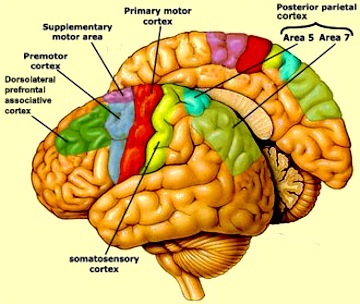 Moreover, in that the right and left temporal lobes are interconnected via the corpus callosum, as well as via the anterior commissure, it is likely that abnormalities in one temporal lobe may well effect the functional integrity of the other. It is noteworthy, however, that among those with left temporal lobe damage, that these patients are more likely than those with right sided lesions to also complain of thought blocking, and feelings of emptiness: "feelings don't reach me anymore" (Weil, 2016). Presumably this is a consequence of limbic disconnection. 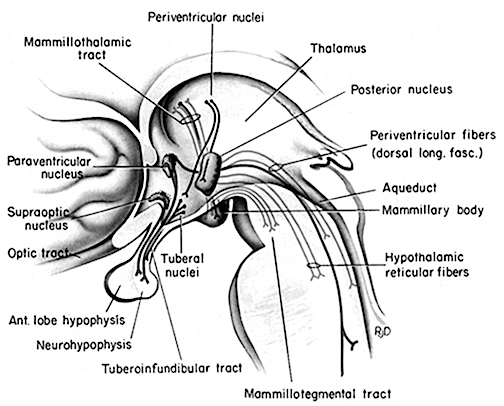 That is, the seizure foci (or lesion) acts to disconnect the limbic areas, such as the amygdala, from the temporal (or orbital frontal) lobes. In consequence, percepts and thoughts no longer come to be assigned emotional or motivational significance. Mania in the absence of severe depression appears to be far more likely with right temporal, and in particular, right frontal lesions -especially in men (Joseph 1986a, 1988a; 1999a). Given the dominant role of the frontal lobes, and the right frontal lobe in particular, in the control and regulation of arousal (chapter 19) it is perhaps not surprising that injuries involving this tissue may result in a loss of control over arousal. 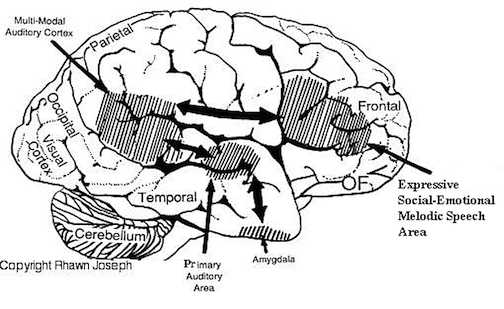 Moreover, as the right frontal lobe appears to exert bilateral influences on cerebral activation and inhibition, it is also this portion of the brain that when damaged is the most likely to produce activational disturbances including mania. 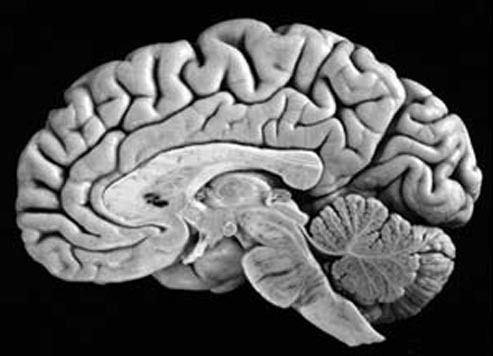 In addition, since the right hemisphere is dominant in the perception and expression of facial, somesthetic and auditory emotionality, damage to this half of the brain can result in a variety of affective and social-emotional abnormalities including lability, florid manic excitement, pressured speech, bizzare confabulatory responding, childishness, irritability, euphoria, impulsivity, promiscuity and abnormal sexual behavior (Bear, 1977, 1983; Bear & Fedio, 1977; Clark & Davison, 2018; Cohen & Niska, 2010; Cummings & Mendez, 2014; Erickson, 1945; Forrest, 2015; Gardner et al., 1983; Gruzelier & Manchanda, 2015; House et al. 2010; Jamieson & Wells, 2015; Jampala & Abrams, 2013; Joseph, 1986a,1990d; Lishman, 1968; Offen et al. 2013; Rosenbaum & Berry, 2012; Spencer et al. 1983; Spreen et al., 1965; Starkstein et al. 2018; Stern & Dancy, 1942). 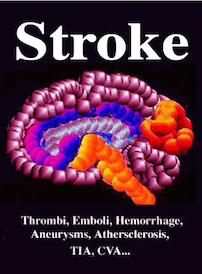 For example, M. Cohen and Niska ( 2010) report an individual with a subarachnoid hemorrhage and right temporal hematoma who developed an irritable mood; shortened sleep time; loud, grandiose, tangential speech; flight of ideas; and lability and who engaged in the buying of expensive commodities. Similarly, Oppler (1950) documented an individual with a good premorbid history who began to deteriorate over many years' time. Eventually, the patient developed flight of ideas, emotional elation, increased activity, hypomanic behavior, lability, extreme fearfulness, distractability, jocularity, and argumentativeness. The patient was also overly talkative and produced a great deal of tangential-circumstantial ideation with fears of persecution and delusions. 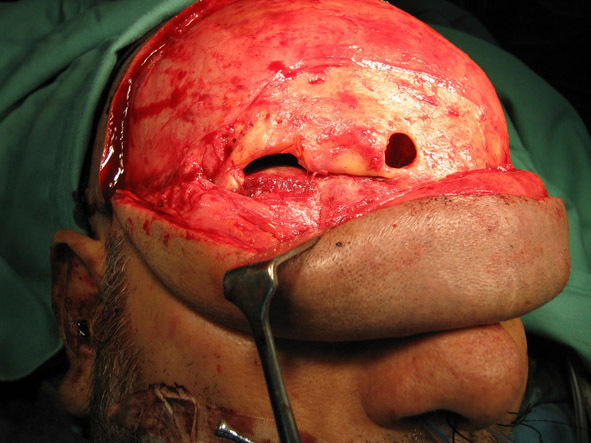 Eventually a tumor was discovered (which weighed over 74 grams) and removed from the right frontal-parietal area. Confabulation, hypersexuality, tagentiality, and manic like behaviors seem to be more frequently associated with right frontal dysfunction (Joseph, 1986a; 1988a, 1999a), particularly among men. Hence, when the right (or both) frontal lobes are severely it is not uncommon for those afflicted to behave in an inappropriate, labile, and disinhibited fashion. Individuals may become hyperactive, distractable, hypersexual, tangential, and confabulatory and behave in a childish, impulsive, euphoric manner (e.g. Lishman, 1968). And, it is just as likely for such individuals to just as suddenly cease their antics and to become largely unresponsive and seemingly disinterested in their environment until provoked, sometimes by seemingly inconsequential and trivial stimuli. 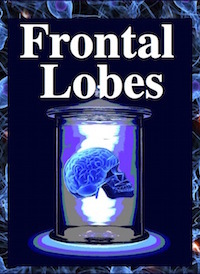 Although men are probably more likely than women to develop mania with right frontal lesions, females may be similarly affected, particularly if both frontal lobes and the orbital areas have been damaged. In one case, for example, a woman of 46 was admitted to the hospital and observed to be careless about her person and room, incontinent of urine and feces, to sleep very little and to act in a hypersexual manner. Her symptoms had developed several months earlier when she began accusing a neighbor of taking things she had misplaced and on other occasions stripping in front of him. She began going about in just her nightdress, informing people she was descended from queens, was very rich, and that many men wanted to divorce their wives and marry her. During her hospitalization she was frequently quite loud, disoriented to time and place, and extremely tangential, jumping from subject to subject. 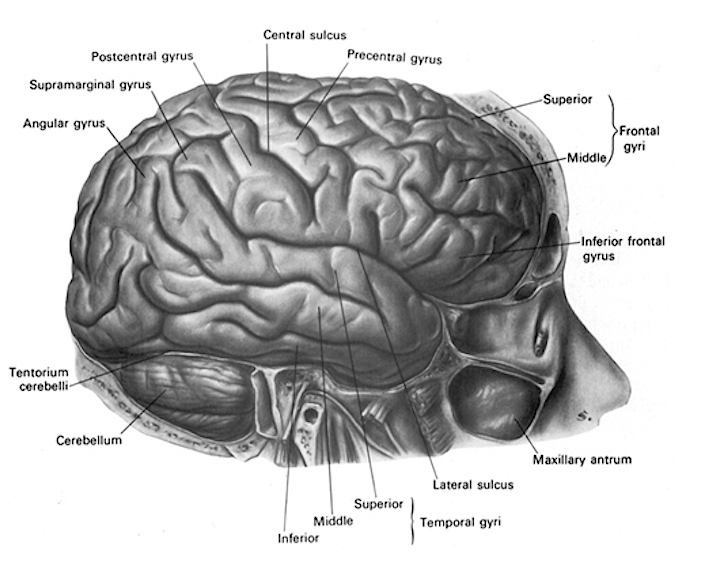 Eventually a meningioma involving the orbital surface of her frontal lobes was discovered (Girgis, 1971). As noted, although laughing and joking one moment, these same patients can quickly become apathetic and disinterested and/or irritated, angered, enraged, destructive, or conversely tearful with slight provocation. Presumably, patients with right frontal injury are more likely to produce not only manic-like behaviors but delusional and confabulatory speech due to disinhibition and the flooding of the speech areas with ideas that are normally filtered out (Joseph 1986a, 1988a). Right frontal injuries are also more likely to mimic orbital injuries including the loss of regulatory restraint over limbic and thus emotional as well as motivational functioning. Patients may not only talk too much, but eat and drink too much, as well as behave in a socially and emotionally inappropriate manner. Because these brain structures perform specific functions, damage involving certain regions of the brain are more likely to give rise to specific psychiatric symptoms as compared to damage to a different portion of the brain. For example, mania is not uncommon, at least initially, following right frontal injuries (particularly in males), whereas left frontal injuries are more likely to produce negative symptoms such as blunted forms of schizophrenia and apathetic depression (Joseph, 1999a). More emotional affective disorders, such as depression with suicidal idea or feelings of guilt, or so called "positive" schizophrenia, are associated with left and right temporal lobe injuries. 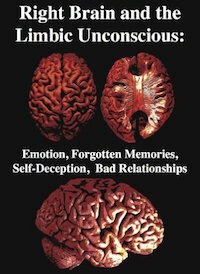 In previous chapters, the symptoms associated with injuries to particular regions and lobes of the brain were detailed. The purpose of this chapter is to provide basically the same data, but from a sympomatic perspective. That is, rather than discussing the symptoms associated with, for example, frontal lobe injury, instead depression will be presented, and then those areas of the brain which when injured give rise to depressive symptomology, will be discussed. Hence, this chapter provides an overview and summary of those findings which are scattered throughout the different chapters of this text. Specifically, the different neuroanatomical regions linked to specific psychiatric disorders will be reviewed with an emphasis on functional localization and differences in symptomology. Neurochemical contributions to some forms of depression and psychosis will also be briefly reviewed. 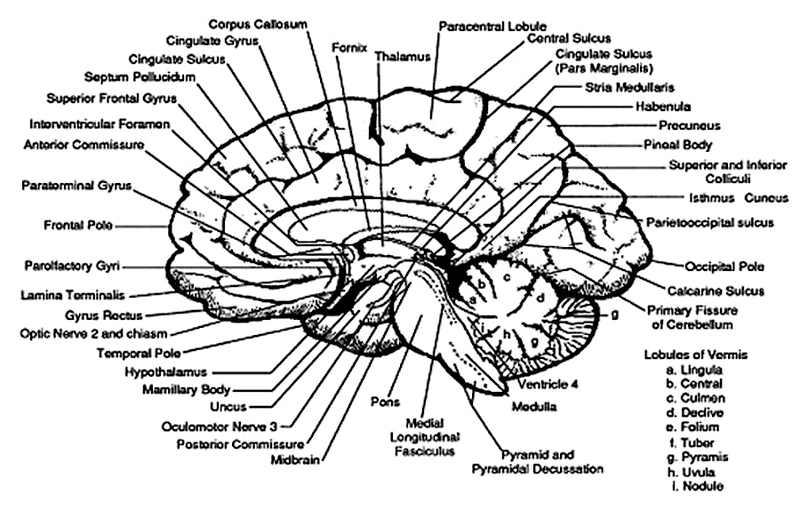 FRONTAL LOBE DEPRESSION Depression is often a realistic reaction to injury or death, or other misfortunes. In order to become realistically depressed also requires the cognitive capacity to appreciate and thus feel depressed about the sad nature of the circumstances that they are confronted with. 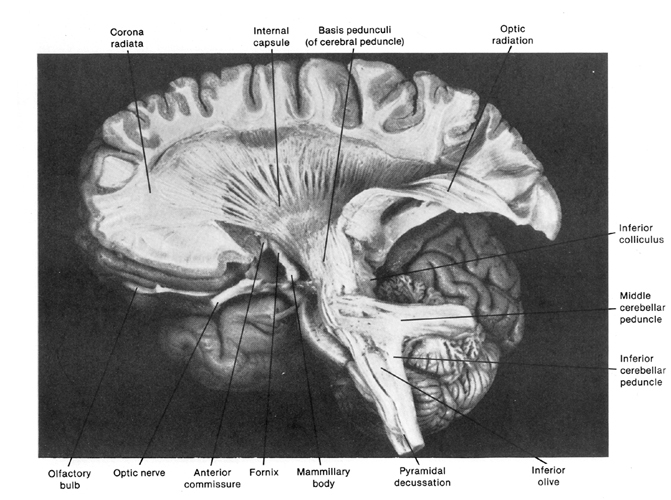 In consequence, that area of the brain mediating the depression may become excessively active, whereas yet another region of the cerebrum which is expressing the depression may become underactive. In general, it has been found that the right frontal lobe demonstrated increased activity in response to negative moods (Rauch et al., 1996; Shin et al., 2007, 1999; Teasdale et al., 1999) whereas left frontal activity decreases (Bench et al., 2016). In fact, repetitive transcranial magnetic stimulation of the right frontal lobe reduces depressive symptoms (Klein et al., 1999), whereas left frontal activity increase with the alleviation of depression as demonstrated through functional imaging studies (Bench et al., 2016). Not only reductions in left frontal activity, but injuries to the left frontal lobe have been consistently associated with depression, "psycho-motor" retardation, apathy, irritability, and blunted mental functioning. For example, when Broca's area has been injured, patients not only have difficulty with expressive speech (Bastiaanse 2016; Goodglass and Kaplan 1999; Haarmann and Kolk 2014; Hofstede and Kolk 2014; Sarno, 1998) but they typically become exceedingly frustrated, irritable, and depressed (Gainnoti 1972; Robinson and Benson 1981; Robinson and Szetela 1981; Robinson and Downhill 1996). Indeed, these patients are typically painfully aware of their deficit and thus become realistically depressed (Gainotti 1972; Joseph, 1988a). 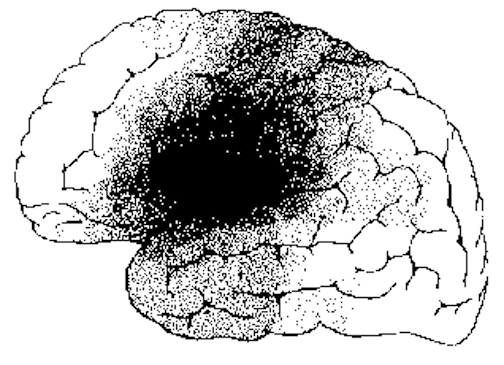 In fact those with the smallest frontal convexity lesions often become the most depressed (Robinson and Benson 1981). Depression in these cases appears to be a normal reaction and as such is mediated by undamaged tissue; i.e., the right frontal and right temporal lobe. That is, the right hemisphere being emotionally astute, reacts appropriately to the patient's condition and becomes depressed. Likewise, patients who are severely depressed have been shown to demonstrate insufficient activation and a significant lower integrated amplitude of the EEG evoked response over the left vs right frontal lobe (d'Elia and Perris 1973, Perris 1974). 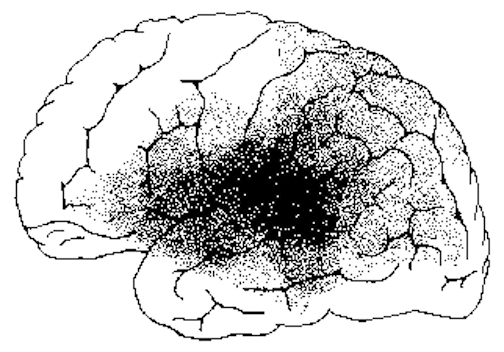 Based on EEG and clinical observation, d'Elia and Perris have argued that the involvement of the left hemisphere is proportional to the degree of depression. Moreover, with recovery the amplitude of the evoked response increases to normal left hemisphere levels--as is also the case as demonstrated in functional imaging studies (Bench et al., 2016). Left frontal lobe depression is therefore seen in those who are aphasic, and those whose depression has been long standing or even recently provoked. The more severe the depression, the greater is the reduction in left frontal functioning (whereas with mild transient sadness there might be a reduction in right frontal activity). Hence, with massive left frontal dysfunction, including even when Broca's area is spared, patient may become exceeding depressed, apathetic , hypoactive and indifferent (Robinson et al. 2014; Robinson and Szetela 1981; Sinyour, et al. 1986). With severe injuries patients may in fact become apathetic and emotionally blunted (Blumer and Benson 2012; Freeman and Watts 1942, 1943; Girgis 1971; Hecaen 1964; Luria 2010; Passingham 1993; Stuss and Benson 1986; Strom-Olsen 1946). One patient who "prior to his accident requiring amputation of the left frontal pole, had been garrulous, enjoyed people, had many friends, was active in community affairs" and had "true charisma... became quiet and remote, spent most of his time sitting alone smoking, and was frequently incontinent of urine, and occasionally of stool. He remained unconcerned and was frequently found soaking wet, calmly sitting and smoking. When asked, he would deny illness" (Blumer and Benson 2012, p. 196). In large part the production of temporal lobe depression may be due to the rich interconnections maintained between the amygdala and temporal lobe. That is, in many cases it is an abnormal amygdala which produces abnormal temporal lobe seizure activity (Gloor, 2007). Given the profound role of the amygdala in all aspects of emotional and personality functioning, in consequence, emotional and emotional-perceptual functioning becomes abnormal to varying degrees and patients may appear not only depressed but perhaps psychotic. 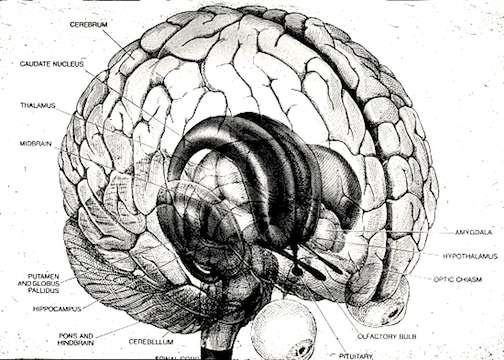 As noted, frontal lobe depression may be characterized by apathy and even a paucity of depressive thoughts. By contrast, the thought processes of those with temporal lobe depression may result becomes infected with depressive and psychotic ideation and related impulses. The patient thinks terrible things about themselves, condemns themselves, contemplates suicide, and so on. 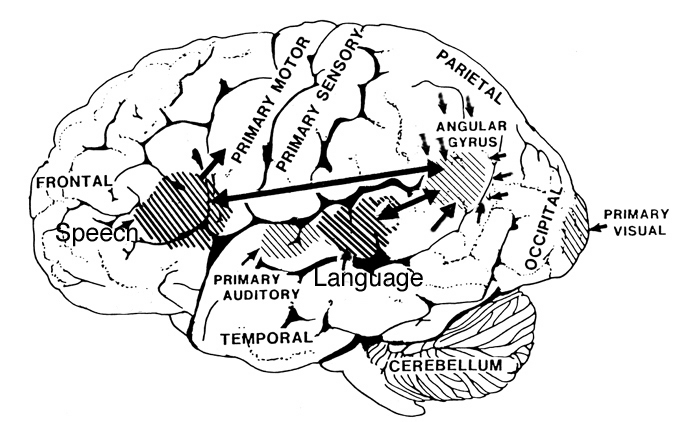 The contamination of language and thought with depressive ideation is a consequence of the rich interconnections maintained between the amygdala and the primary and secondary auditory areas (including Wernicke's area in the left hemisphere), as well as the visual and somesthetic cortices. Hence, perceptual as well as thought and language formation may become infected with depressive and psychotic impulses and abnormally invested with emotional, paranoid, and even religious significance (Bear et al., 1979; Gibbs, 1951; Gloor 1992; Gloor et al., 2015). In fact fear followed by depression are the most common emotional experiences associated with abnormal temporal lobe activity (Gloor 1992; Gloor et al., 2015; Halgren 1992; Williams, 2016). Thus some patients may fear that they are responsible for what depresses them, and/or what depresses others and as such they may appear more paranoid and delusional than depressed. 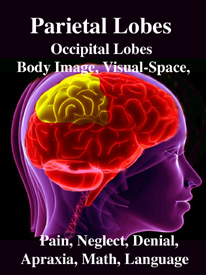 It is noteworthy, however, that among those with left temporal lobe damage, that these patients are more likely than those with right sided lesions to also complain of thought blocking, and feelings of emptiness: "feelings don't reach me anymore" (Weil, 2016). Presumably this is a consequence of limbic disconnection. 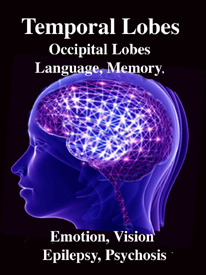 That is, the seizure foci (or lesion) acts to deconnect the limbic areas, such as the amygdala, from the temporal (or orbital frontal) lobes. 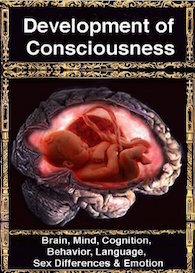 In consequence, percepts and thoughts no longer come to be assigned emotional or motivational significance. Although the amygdala is dominant in regard to all aspects of emotion, it is dependent on the hypothalamus and frequently acts at the behest of hypothalamic impulses and homeostatic needs (Gloor, 2007; Joseph 1992a). 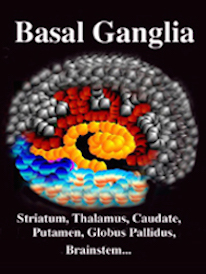 Conversely, the amygdala also exerts tremendous modulatory influences on the hypothalamus. 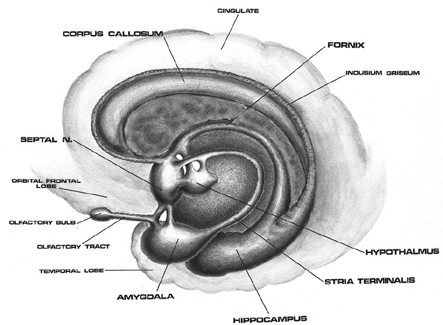 Hence, abnormalities involving the amygdala can influence the hypothalamus, and vice versa. 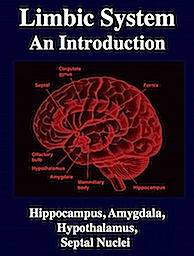 Moreover, both nuclei influence the sleep cycle, dream sleep, and even the capacity to experience pleasure when eating (see chapter 13), and the amygdala as well as the hypothalamus are strongly influenced and dependent on NE and 5HT which are also directly implicated in the genesis of depression. 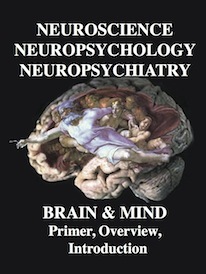 As detailed in chapter 13, feelings of pleasure are associated with activation of a number of diverse limbic areas including the amygdala, cingulate, substantia nigra (a major source of dopamine), locus coeruleus (a major source of norepinephrine), raphe nucleus (serotonin), medial forebrain bundle, and orbital frontal lobes (Brady, 2010; Lilly, 1960; Olds & Forbes, 1981; Stein & Ray, 2009; Waraczynski et al. 2018). The predominant locus for pleasurable feelings, however, is within the lateral hypothalamus (Olds, 1986; Olds & Forbes, 1981). 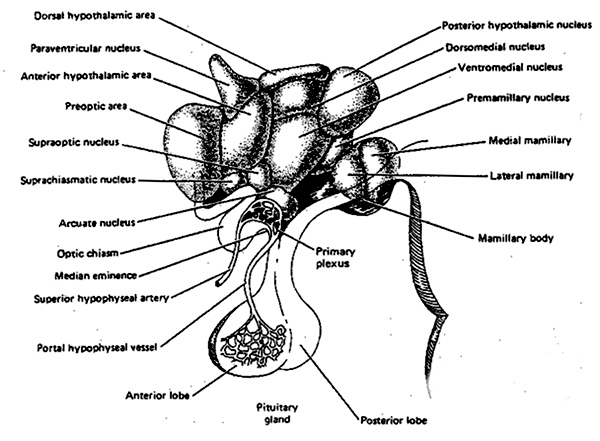 In contrast, activation of the medial hypothalamus is associated with aversive and unpleasant sensations (Olds & Forbes, 1981). 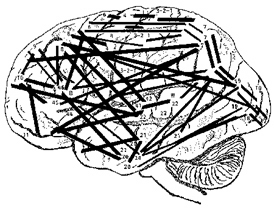 However, as the lateral and medial nuclei exert, in part, counterbalancing influences (Joseph 1992a) abnormalities in the lateral region (and or abnormalities associated with amygdala input) may not only result in a loss of pleasure, but create sensations of unpleasure; which, if prolonged would probably lead to feelings of hopelessness and despair; i.e. severe depression. For example, the hypothalamic-pituitary axis secretes melatonin in phase with the circadian rhythm, and phase-delayed rhythms in plasma melatonin secretion have been repeatedly noted in most (but not all) studies of individuals with Seasonal Affective Disorder (reviewed in Wirz-Justice et al. 1993). This is significant for melatonin is derived from tryptophan via serotonin and low serotonin levels have been directly linked to depression (e.g. Van Pragg 2015). However, with light therapy melatonin secretions return to normal and the depression may be relieved. 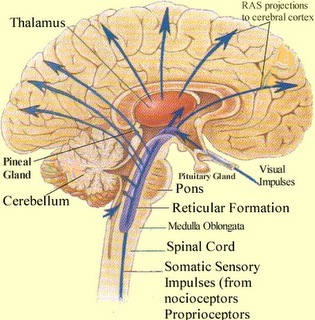 The presence of absence of light, however, may be only one factor among many effecting the SCN. For example, disturbances in temperature perception and the 5HT system may deregulate SCN activity, as can the process of aging (Aronson et al. 1993). In consequence, rest vs active cycles also become abnormal, with reductions in arousal and activity; i.e. the patient becomes depressed. In addition, depression and SCN abnormalities may be a consequence of emotional stress on the hypothalamus (Chauloff 1993) as well as on the amygdala and the NE and 5HT systems. For example, the hypothalamic-pituitary axis is tightly linked with and in fact mediates stress induced alterations in serotonin (Chauloff 1993, Fink, 1999); as well as norepinephrine (Swann et al. 2014) which has also been repeatedly implicated in the genesis of depression. The hypothalamic, pituitary, adrenal system (HPA) is critically involved in the adaption to stressful changes in the external or internal environment, whereas hyperactivity of the adrenal gland is clearly associated with major depression. In fact, the adrenal glands have been shown to increase in size during episodes of major depression and to then revert to normal size during remission (Rubin et al. 2016). In part, this may be secondary to (internal or externally induced) stress, and/or a disruption in the HPA feedback regulatory system. For example, in response to fear, anger, anxiety, disappointment, and even hope, the hypothalamus begins to release corticotropin releasing factor (CRF) which activates the andenohypophysis which begins secreting ACTH which stimulates the adrenal cortex which secretes cortisol. Among certain subgroups suffering from depression, it appears that this entire feedback regulatory system and thus the HPA axis is disrupted (Carrol et al. 2013; Sachar et al. 1973). This results in the hypersecretion of ACTH and cortisol with a corresponding decrease in NE; which results in NE induced depression. It was these findings which led to the development of the Dexamethasone suppression test over 25 years ago; i.e. individuals suffering from depression show excess cortisol, and an increased frequency of cortisol secretory episodes (Carrol et al. 2013; Sachar et al. 1973; Swann et al. 2014). It is also noteworthy that dexamethason nonsuppression rates are increased in mania; specifically "mixed manic" states which consist of lability, grandiosity, and lability superimposed over depression (see Swann et al. 2014). These "mixed manic" individuals also display elevated NE levels but respond poorly to lithium and show higher levels of cortisol during the depressed phase of their illness (Swann et al. 2014). 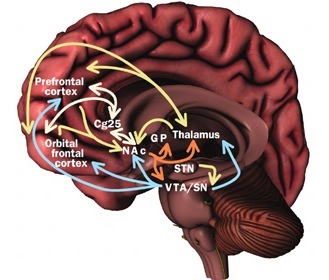 Nevertheless, NE and 5HT abnormalities do not exclusively influence the hypothalamus, but also exert widespread influences throughout the neoroaxis, especially the amygdala which may well interact with the hypothalamus in the production of certain forms of depression. As is now well known, major factors in the pathogenesis of depression include disturbances in the locus coeruleus (LC)-NE and 5HT systems (Arranz et al. 2014; Delgado et al. 2014; Pandey et al. 2016); neurotransmitter systems which fuel the amygdala, inferior temporal lobe, as well as the frontal lobes and hypothalamus. 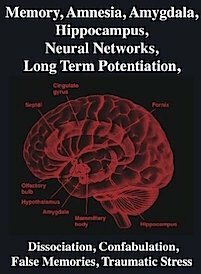 For example, a disturbance in NE synthesis and metabolism, regardless of its cause, will disrupt limbic and cortical functioning and arousal, reduce neuroendocrine activity, and thus the organisms ability to mobilize its defenses in response to stress, adverse experience, or even self-defeating thoughts. Every component of social-affective expression will be altered, especially that related to the experience of pleasure and reward -a condition conducive to depression. Presumably this is also due to related abnormalities in the amygdala, inferior temporal lobe, etc. Similarly, when 5-HT levels are reduced individuals may become depressed. There is also an increased tendency to respond to non-rewarding situations (Sourbrie, 1986) and to continue to respond regardless of punishment (Spoont, 1992). Effected individuals may fail to avoid or may even be drawn to abusive or potentially frightening or traumatic situations, and may seem helpless to alter their behavior, e.g. learned helplessness (see Charney et al. 1993; Krystal 1990). Indeed, reduced 5-HT, including abnormalities in platelet serotonin receptors, has been repeatedly noted in the brains of those who have committed suicide and taken their lives in a violent fashion (e.g. Brown et al. 2015; Cronwell & Henderson 2016; Pandey et al. 2016). Presumably, in these cases associated abnormalities in the hypothalamus (loss of pleasure) and amygdala (depression and violent suicide) are implicated. Although it is difficult to classify a depressive episode or psychosis strictly in terms of an anatomical location or biochemical abnormality, it has been known for over two decades that there are at least two subgroups who differ in regard to depressive symptoms and NE and 5HT activity levels (Goodwin et al. 1978; Van Dongen 2015; Van Praag 2015), as well as a third group with bipolar disorder who show elevated D2 dopamine receptors (Pearlson et al. 2016). For example, those with an NE depression may behave in a more emotionally labile and expressive manner, whereas those with a 5HT depression may demonstrate a much more profound motor retardation coupled with social withdrawal and confusion due to sensory overload. Moreover, both groups respond differently to pharmacological treatment. For example, some respond to best to impramine which inhibits NE reuptake (thus increasing NE levels in the synapse), whereas others react best to amitriptylline which potentiates 5HT (Goodwin et al. 1978; Van Praag 2015) and inhibits NE reuptake. This suggests that among some individuals NE and 5HT may simultaneously contribute to a distinct form of depression. As per the role of dopamine, it appears that depressed and bipolar patients who display elevations in D2 dopamine receptors are more likely to appear psychotic than suffering from a mood disorder (Pearlson et al. 2016). Hence, those with dopamine abnormalities tend to more closely resemble patients with schizophrenia.